Green Korea United (GKU) visited Seoul this month for an informative exhibition at Seoul’s National Assembly. 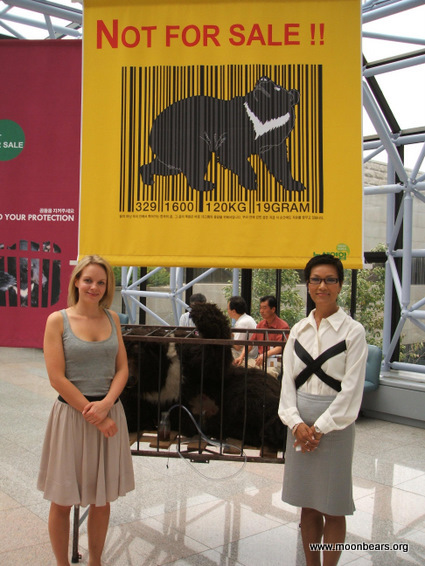 Joined by Lucie Evans of the World Society for the Protection of Animals (WSPA), GKU urged the Korean government to end the 30 year history of bear farming policy in the country. On July 9 at the National Assembly Seoul, Green Korea successfully held a special exhibition inviting 30 guests from all different areas – including members of the National Assembly, doctors of Korean Traditional Medicine associations and executives of the bear farmer’s association. The exhibition concluded with guests putting bear foot prints in ink on a white board with the title ‘Passage to a Freedom’. Each guest was also invited to write a comment alongside their ‘print’. Ms Kim Miyong – the bear team manager of Green Korea added a message which argued that it is now time to act to end the 30 years of agony and for the Government to change its policy on the bear farming issue and to legislate to ban the bear farming industry. Mr. Yeom, Kwang-ho, the Chairman of the Bear Farm Association also expressed his hope that the Korean government will buy all 1140 farmed bears across the country. He estimated total cost of compensating bear farmers to be 20 to 30 billion won (20 to 30 million dollars) – asking a minimum of 17.5 million won per bear. Since the bear farmers are also responsible for joining this industry, many argue that this figure is unreasonable and would prove impossible to be met by the Korean government when the compensation process eventually starts. Naturally, none of these figures include the cost of moving the bears to sanctuaries to see out the rest of their days. Nonetheless, this action by Green Korea is a wonderful start. Again, well done Green Korea! Green Korea United works with WSPA and local NGOs to urge the Korean government to end the 30 year history of bear farming policy in the country.